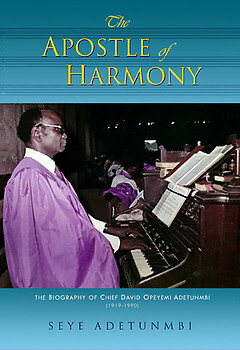 A full production project (pre-press including cover design to print production), The Apostle of Harmony was commissioned by Messrs Dayo and Seye Adetumbi for the publication of this biography of their late father, Chief D.O. Adetumbi to commemorate the 20th anniversary of his passing in 1991. The book is scheduled for release in the second quarter of 2011 and is to be circulated privately by the author. Seye Adetunmbi is the fifth child and the third son of the biographical subject, Chief D.O. Adetunmbi and his wife Chief (Mrs.) Comfort Modupe Adetunmbi. A Chartered Stockbroker and Investment Banker by profession, Okan Seye Adetunmbi holds the chieftaincy title of the Okanlomo of Ikole-Ekiti.